Despite working with lower inventories, this year’s November sales activity was up over lastyear’s in the 5-county Southeast Michigan market (Wayne, Oakland, Macomb, St. Clair and Livingston). While there is fluctuation by area and price range, overall, values are up. 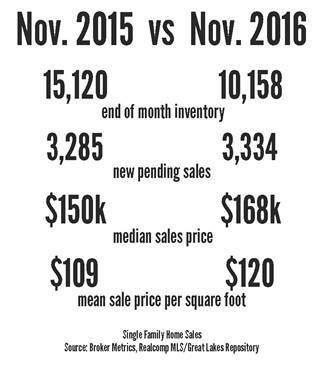 Median sale price was up 12 percent and mean sale price per square foot was up 10 percent over November 2015. With interest rates finally ticking up, buyers should be making their moves sooner rather than later. Because most buyers finance, the amount of their monthly payment is typically more relevant to affordability than even the sales price. The ability for buyers to finance at today’s lower interest rates provides a window of opportunity for both buyers and sellers. Buyers get to lock in with a lower payment for the life of their loan. Sellers get to sell for a higher price. Recent financial predictions and actions taken by the Federal Reserve indicate that this low interest rate window is shrinking. Should We Buy/Sell this Winter? Many factors other than season or weather impact when people need to move. The lifeevents that often dictate the timing of a move aren’t dependent on seasons. Births, deaths, marriages, divorces, new employment, corporate transfers and other events happen throughout the year. • Predictions of Interest Rate Increases—as interest rates increase, affordability decreases. 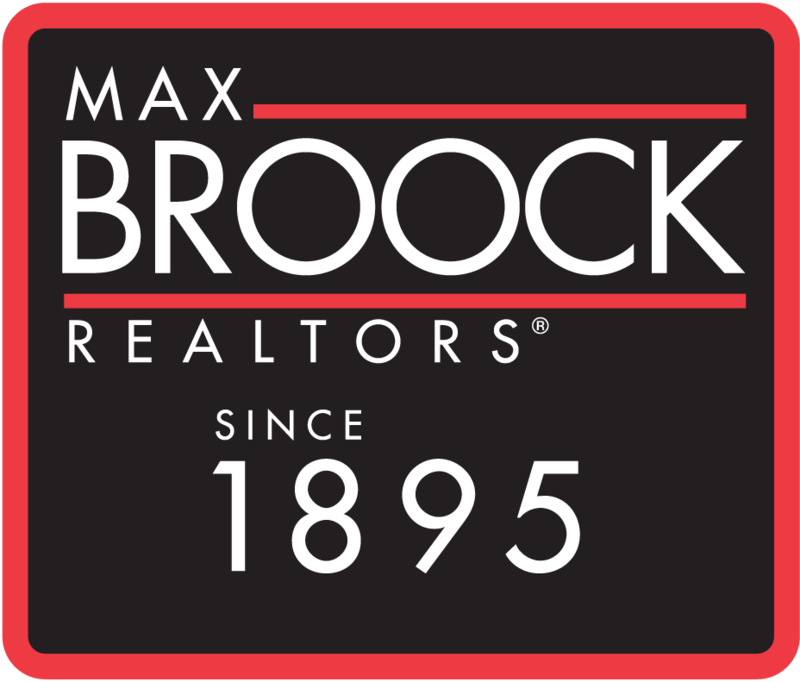 • Price Increases—average sales price rose in nearly all Southeast Michigan markets at rates that exceeded average income increases. Prices will likely continue to rise. The combination of rising interest rates and prices may adversely affect future affordability. Buying sooner may be a better choice. • Personal Motivations/Needs—People who are considering moving, usually have reasons for wanting to move. Once they make up their mind to do something (changing jobs or moving), acting on the decision is usually a more productive use of their time than waiting. Getting to where they want to be sooner will put them a step ahead with moving on with their lives. • Predictions of Interest Rate Increases—as interest rates increase, fewer buyers will be able to afford your home at a given price. Higher interest rates will also affect the seller’s ability to buy/afford their replacement home. • Supply/Demand—while sales activity frequently drops off through Winter months, there are also far fewer available homes for motivated Winter buyers—both buyers who are new to the market and buyers who didn’t find what they were looking for due to previous low inventories. Many available listings are left over from the prior season and may be tired or over-priced. 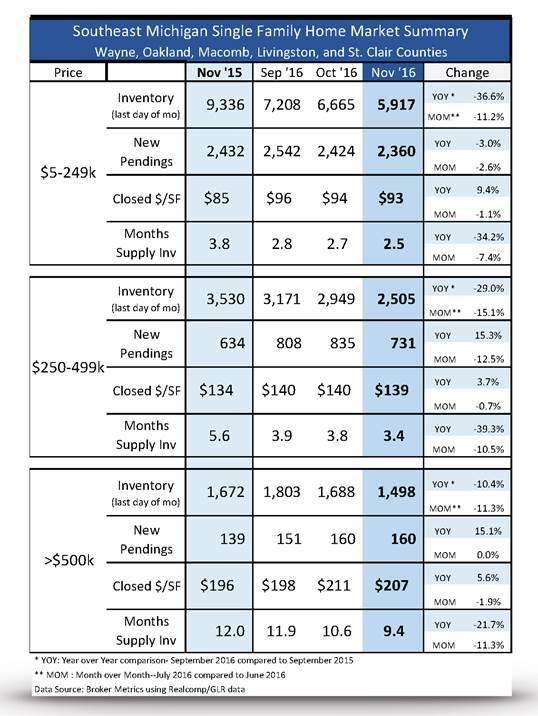 Through November, inventory levels dropped off more than sales activity. It’s a great time to put a sharp home on the market. • Personal Motivations/Needs—Like buyers, people who are thinking of selling have their reasons. There are typically costs involved in holding onto a home that no longer fits or is no longer needed. Sellers should consider their individual circumstances in deciding if moving forward with their sale and their lives sooner is better than waiting. People often put themselves at a disadvantage by postponing a move without considering the pros and cons and making an informed decision. Real estate agents who understand both trending market conditions and client motivations are in position to counsel good decisions.